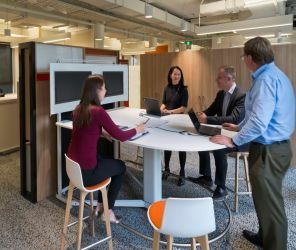 Open plan workplaces that evolved over the 20th century are a product of management pursuit of efficiency and reliability that has its roots in early management doctrines. Such strategies have served us well, but are becoming less relevant today as organisations embrace new strategies including people and innovation in the new disruptive economy. Moreover, organisations are moving from measuring individual productivity to that of high performance teams. But despite this, management and the human resource profession continue to measure productivity based on individual activity and output rather than on team performance. Furthermore, organisations continue to design and build workplaces that do not support the team. While large organisations are quick to adapt to the new team based strategies, their workplace lags behind in the old paradigm, slowing business growth. A high performance team is the new paradigm of workplace productivity. But there is no single productivity measure that can be applied to all teams. It is submitted here that each team has its own unique productivity measures, and this requires a "balanced" workplace that provides a unique combination of team playbook, team work tools and team work space. Team Based Working provides the foundation for high performance teams, and it is being currently trialed by La Trobe University Research.